The quality of English language education depends on the quality of english teachers. In the present era scientific and technological advancement , it is obvious that more and more importance is given for English language teaching at all levels. Message from the Commissioner of School Education AP. 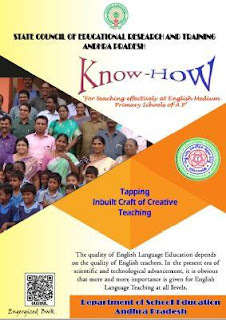 I am very much delighted to write the Foreword for the “Primary Teacher’s hand book titled, “Know - How” which is aimed at empowering the teachers handling English Medium sections at Primary level. The Government of Andhra Pradesh has introduced English Medium sections from 1st Class onwards as per the aspirations of parents and society during this academic year 2018-2019. This book, “Know – How” has been prepared by SCERT AP to enable and empower the Primary Level Teachers in handling English Medium sections. I hope that this “Know -How” will serve to achieve the intended purpose of empowering the teachers and strengthening our English Class rooms at the grass root level.